More Than You Ever Wished to Know About Lemonade…. 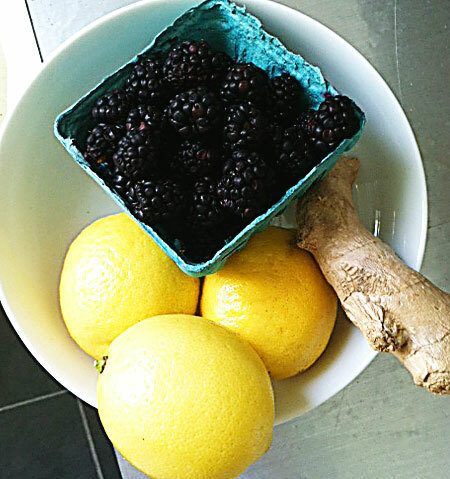 lemons and ginger and berries, oh my! Since a lovely Farmer’s Market popped up a block away from my apartment a month ago, I have found myself with an embarrassment of riches in the fresh fruits and veggies department. 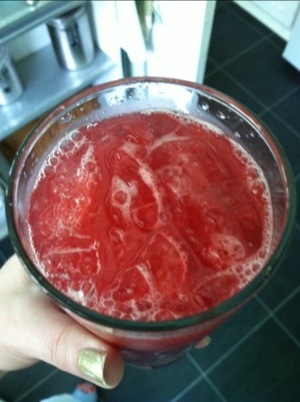 Pretty much every day that I am not making Sangria, I whip up a batch of lemonade with some kind of berry in it. Blackberry, Blueberry, Strawberry, Raspberry…. sometimes with mint, or ginger, or thyme…. it’s a really versatile recipe that lends itself to endless variations and, when poured into a glass bottle, makes a lovely host gift at a backyard barbecue. The main component in the recipe is the berry infused simple syrup. I choose to add the pureed berries to the simple syrup n the stove just to bring the fruit to a boil for a second. It gives the fruit a very subtle jamminess in comparison to just adding the pureed fruit to the finished lemonade, but the health code hypochondriac in me prefers to bring things up to temperature to kill any potential pests or germs. You can certainly just add the fruit to the lemonade if you want to. I won’t judge. None of these lemonades suffer at all from the addition of vodka, silver tequila, rum, or whiskey, in case you were wondering…. A well-squeezed lemon should yield about 2 ounces of liquid, so for a cup of juice you’ll need four lemons. Puree berries in a blender, adding a little of the water, if necessary. Combine fruit puree with sugar and water in a heavy saucepan over medium heat. Stir occasionally until sugar dissolves and syrup comes just to a boil (about 8-10 minutes). Remove from heat and cool. Strain cooled syrup through a fine mesh strainer; discard solids. Combine lemon juice and water in a 2 quart pitcher. Add berry syrup half a cup at a time, to reach desired sweetness (I typically end up adding it all). Add in a pinch of salt and stir to combine. Some great additions are ginger, mint, and thyme. Some killer combinations are Blackberry-Ginger, Strawberry-Thyme, Raspberry-Mint, and really any other combination. When adding mint, smack it a little to release the oils in the leaves and add to the finished lemonade. With fresh thyme, add the thyme to the simple syrup while it cools, and strain out with the rest of the solids. With ginger, peel the ginger and puree with the berries before making the simple syrup. A little tip on peeling ginger– stay away from the vegetable peeler and grab a tablespoon instead. Run the edge of the spoon along the skin and it should scoop right off. Be careful not to get any ginger juice in your eye, though. That stuff stings like crazy. It’s so easy to peel ginger with a spoon. 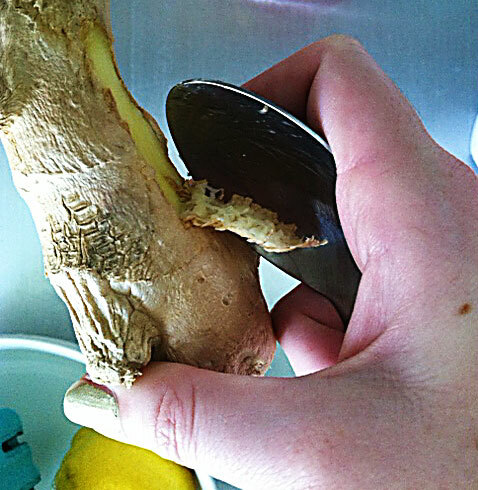 You won’t cut your fingers up with a sharp peeler, and the spoon gets around all the knobs of the ginger root easily. Just DON’T GET GINGER JUICE IN YOUR EYES!!! When I make ‘plain’ lemonade, I like to zest two of the lemons before I juice them all, and add the zest to the simple syrup just after it comes to a boil. This adds another layer of lemony goodness to the finished lemonade and it mushes the lemons around to get them nice and juicy on the inside before I squeeze them. I keep it to about a teaspoon of zest, though, more than that and it can taste a little soapy. Juice lemons and strain through a fine mesh strainer into a 2 quart pitcher. Add the water and stir to combine. Add simple syrup through the same fine mesh strainer (to strain out the zest), and stir to combine. Serve over ice. Add sugar and water in a heavy bottomed sauce pan. Bring just to a boil over medium heat, stirring every 30 seconds to dissolve the sugar. When all sugar has dissolved, remove from heat and add lemon zest. Cool to room temperature. < Previous Frito. Chili. Pie.